When told you're visiting Gimmelwald, Swiss people assume you mean the famous resort in the next valley, Grindelwald. When assured that Gimmelwald is your target, they lean forward, widen their eyes, and — with their sing-songy Swiss-German accent — ask, "Und how do you know about Gimmelvald?" 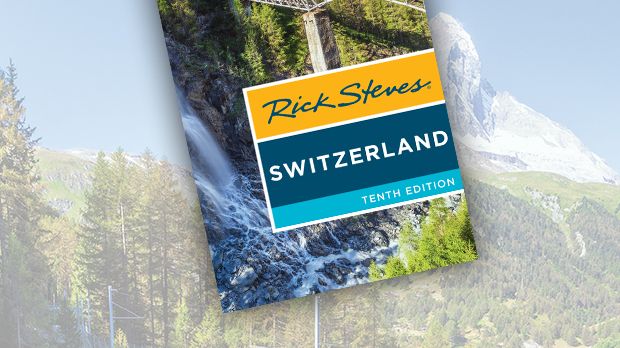 Travelers know to seek out the offbeat places, skipping the resorts and focusing instead on gems like Gimmelwald. This traffic-free village hangs nonchalantly on the edge of a cliff, high above the Lauterbrunnen Valley, 30 minutes south of Interlaken by car or train. This sleepy village has more cow troughs than mailboxes. Here, white-bearded, elfish old men smoke hand-carved pipes, and blond-braided children play "barn" instead of "house." Stones called Schindles sit like heavy checkers on old rooftops, awaiting nature's next move. While these stones protect the slate from violent winter winds, in summer it's so quiet you can hear the cows ripping tufts of grass. There's nothing but air between Gimmelwald and the rock face of the nearby Jungfrau Mountain. Small avalanches across the valley look and sound like distant waterfalls. Kick a soccer ball wrong and it ends up a mile below, on the floor of the Lauterbrunnen Valley. Each year, the people of Gimmelwald systematically harvest the steep hillside outside their windows. Entire families cut and gather every inch of hay. After harvesting what the scythe can reach, they pull hay from nooks and crannies by hand. Half a day is spent on steep rocks harvesting what a machine can cut in two minutes on a flat field. But it's tradition. It's like breathing. And there's one right way to do it. To inhale the Alps and really hold it in, sleep high in Gimmelwald. Poor but pleasantly stuck in the past, the village has a creaky hotel, happy hostel, decent pension, and a couple of B&Bs. Walter Mittler's Hotel Mittaghorn is a black-stained chalet with eight balconies, huge views, and a few tables shaded by umbrellas on its tiny terrace. Evening fun in Gimmelwald happens in the hostel, where young, Alp-aholic hikers are eager to share information on the surrounding mountains. From Gimmelwald, you can ride the modern gondola up the Schilthorn, a 10,000-foot peak capped by a revolving restaurant called Piz Gloria. Lifts go twice hourly, involve two transfers, and take 30 minutes. Watch as the altitude meter goes up, up, up. My favorite way to have breakfast is to ride the early gondola to the summit, and to the restaurant with the thrilling 360-degree view. Here, you can sip coffee slowly to enjoy one complete circle, watching hang-gliders methodically set up and jump into airborne ecstasy. Afterward, I hike down from the summit to the first station below — Birg, which is the best starting point for high-country hikes. Two minutes from the Birg station, I'm completely alone, surrounded by a harsh and unforgiving alpine world. Anything alive is here only by the grace of nature. A black ballet of rocks is accompanied by cowbells and a distant river. Wisps of clouds are exclamation points. The Alps put you close to God. I make it to my target, a peak that stands dramatically high above Gimmelwald. After a steep descent, I step out of the forest at the top end of the village I call home. Walking over a pastel carpet of gold clover, bellflowers, milk kraut, and daisies, I'm surrounded by butterflies and cheered on by a vibrant chorus of grasshoppers, bees, and crickets. The finish line is a bench that sits at the high end of Gimmelwald — one of my "savor Europe" depots. A great dimension of travel is finding the right spot and just sitting still. 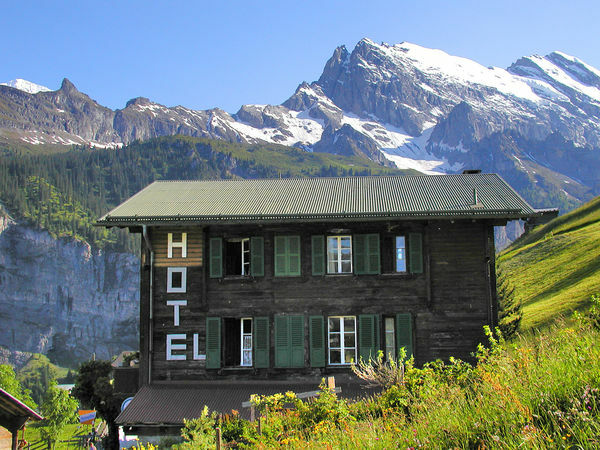 Crickets rattle congratulatory castanets; a river blurts out of a glacier, and Mürren crowns a bluff above me, keeping all the fancy tourists where they belong. An alpine farm that has intrigued me for years still sits high above the tree line, forever alone amid distant flecks of brown-and-white cows and goats. Below me, the village schoolyard rumbles with children. Christian, a farmer (and the town's accordion player), comes back from the fields chugging by on his mini-truck towing a wobbly wagonload of hay. His kids bounce on top like cartoons. Enjoying this alone is fine. But share this bench with a new friend, the sun of a daylong hike stored in your smiling faces, and you'll agree with what I've long said: "If Heaven isn't what it's cracked up to be, send me back to Gimmelwald."